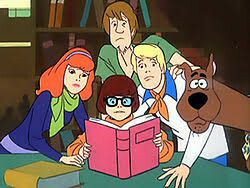 THAT long-running show about four mystery-solving teens - and their infamous dog - is on its last legs. Now in their 40s, the gang face their toughest cases yet: spectres of midlife crises, demons of double-divorce, and ghouls of child-actor syndrome. Having been cast in their teens in the hit kids mystery TV show Meddlin’ Kids, Frank (the leader), Darcy (the hot one), Veruca (the clever one), Humpy (the stoner) and Robert Dubois (the dog) have been straitjacketed into playing the same roles over and over, season after season. It’s always the same old story: show up at a crime scene, question the locals, monster, chase sequence, set a trap, unmask the monster, and let the credits roll. It’s been 25 years, but now out of nowhere the network decides not to renew Meddlin’ Kids for its expected 26th season. At their final ever wrap party party, the gang all look back at what they’ve achieved, and desperately look towards the future. All seems hopeless - that is, until one final, REAL mystery rears its head, a mystery that goes back 25 years and ties the studio to some dodgy dealings. The gang, whose off-screen dynamic has long-since eroded away over the years, will need to step into their on-screen roles one last time. A brand new piece of devised comedy theatre coming to the Edinburgh Fringe this year from Cambridge Footlight and self-proclaimed Scoob-Nut Will Bicknell-Found.